48% Sonoma, 43% Monterey and 9% Santa Barbara, with each county said to contribute its own flavor characteristics. The wine was aged in stainless steel and the predominate varietal is Pinot Noir. As a wine reviewer who receives samples of many different wines, I’m in a good position to see trends. One of the trends I’m seeing is a re-energized emphasis on Rose. Meiomi releasing Rose for the first time is a good example of this trend, in my opinion. I actually started seeing this in 2016 and it’s quite possible it started a year or two prior. Anyway, look for more Rose reviews to come as this trend evolves. For more, check out the Meiomi website. I’ve reviewed other Meiomi wines as well, including Meiomi Chardonnay and Meiomi Pinot Noir (one of my most talked about reviews) if you want to check those out. In appearance, Meiomi Rose is pale salmon in color and very translucent. Light shining through leaves a lovely pale pink glow on the table. It’s quite a leggy wine and it coats up the glass nicely when tipped. Legs appear in various sizes and forms and are mostly slow to fall. I normally don’t expect a Rose to have much of an aroma, but this wine’s aroma is noticeable from a foot away from the glass. It’s enjoyable, with notes of fresh watermelon and strawberry. You might find the aroma similar to a Sauvignon Blanc or a Pinot Grigio. Meiomi Rose alcohol content 13.2% by volume, per the bottle. There’s no sting of alcohol in the nose. On the palate, you get chamomile, cranberry and orange zest coupled with a good bit of minerality and acidity. For some reason, I was expecting sweetness however none was present, which suited me well. I found the taste enjoyable, uncomplicated and easily sippable. The finish was long lasting and pleasant. It started out with the orange zest flavors but then slowly gave way to just a bit of bitterness. 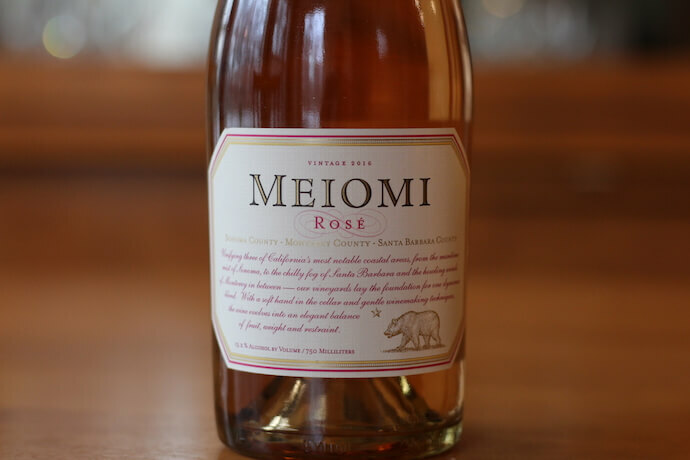 My favorite Pinot Noir has been always Meiomi, However, the day I tasted Meiomi Rose, my eyes were widely opened, beautiful taste to it. Since then, I’ve been trying to buy some, but no luck. It’d be great if you can let me know where to buy the most beautiful Rose! I happen to like the Total Wine stores. You might give them a try if there’s one nearby. I love Meiomi so I will definitely give this Rose a try. Thanks for the comment Monica! If you get a chance, I’d love to hear what you think.